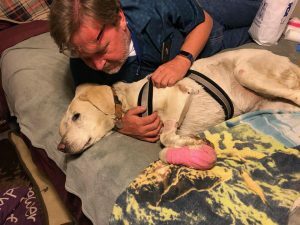 Camp Fire changed lives: a survivor’s story "This is what being a climate change refugee feels like..."
On that awful day, when Paradise was engulfed in flames, I hugged my yellow lab Angel goodbye. I woke up early, 5 a.m., and decided to leave for work without our normal early morning hike. I lived in the foothills, at 2,000 feet, some 37 miles from Chico where I had work to do as a home health RN. Posted on November 27, 2018 November 28, 2018 Categories climate change, Community, Point of ViewTags Camp Fire, climate change, evacuated, refugee5 Comments on Camp Fire changed lives: a survivor’s story "This is what being a climate change refugee feels like..."